It’s slow going, but we’ve made some progress. I’m now confident that this vehicle will at the least be drivable by Thanksgiving! “Cream puff will come later”, the engineer just who built my controller stated yesterday. Ain’t that the truth? I'd like to show you some photos and tips. The engine, transmission and shift linkage have also been put together and installed. Shifting was more like an art form with this car, therefore I bought a kit and replaced the linkage bushings. The firewall bushing had been slightly hard to put in, (somethingn’t in a 914?) but a cup of hot-water to soften up the synthetic bushing did the trick. Picture below programs a bad/worn bushing. I may have pointed out this currently, but I also bought an innovative new pilot bearing the flywheel, and also thought and crush washers. Inexpensive things, but well worth changing while they’re all taken apart. Kudos to Pelican components for technical records that even we, a newcomer, could follow. Motor/transmission mating was done on an extended furniture mover which facilitated their set up into the vehicle. No hoists, chain, or heavy-lifting involved. An assistant and a few jacks were all I needed. Amazing clutch is finally put in. I'd to expand the pilot holes making use of a drill hit, a 5 moment task. That’s after wrestling with all the cover installation for around 30 minutes looking to get them in properly, and cutting my thumb in the process. Those springtime “fingers” have actually razor-sharp edges! Fail or Sweet? 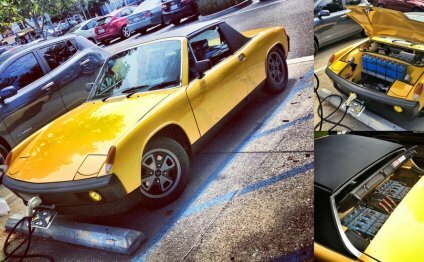 : Porsche 914 Electric Conversion-UNIQUE? The Volkswagen air-cooled engine is an air-cooled boxer engine with four horizontally opposed cast iron cylinders, cast aluminium alloy cylinder heads and pistons, Aluminum crankcase, and forged steel crankshaft and connecting rods.